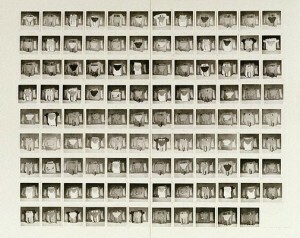 Robert Rooney, ‘Garments 3 December 1972–19 March 1973’, 107 gelatin silver photographs [one unit framed], 7.9 x 7.8 cm; each image, Art Gallery of NSW. Over a period of 107 consecutive days, from December 1972 to March 1973, Robert Rooney photographed the clothes he wore. Each black and white image is uniform, a latent pun in keeping Rooney’s predilection for wry linguistic play. The artist’s garments are neatly folded and stacked, underwear on top, outer wear at the bottom, as if positioned by a time-and-motion technician intent on maximising the efficiency with which Rooney dressed. Any flicker of intimacy in Garments 3 December 1972–19 March 1973 (1973) is snuffed out by Rooney’s clinical, systematic approach to the photographic project. Less a diary and more an exercise in mute documentation, Garments seems to evacuate the artist even as the viewer is invited into his boudoir. Five years later, Rooney commenced a very different sequence of photographic portraits, seventy-five of which are on show at Tolarno Galleries. 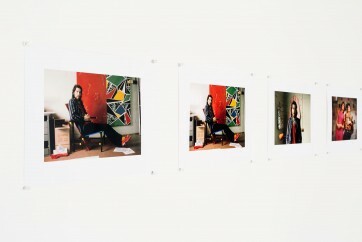 Seen as suite, the richly coloured digital prints (derived from Rooney’s original 35mm slides) register a significant change in both the artist’s practice and his perception of his milieu. Like Garments, the portrait photographs are intimate and domestic, but there the resemblance ends. The body of the artist is reinstated, often at close quarters, in almost conversational circumstances. These are photographs shot, in the main, across kitchen tables. Few are full length, most are casual in their scaling of subject to both setting and frame. Significantly, very few show artists in their studios, and none show the artist at work. The great tropes of the golden age of Life magazine artist portraiture are abandoned. There’s nothing of Rudy Burckhardt, Martha Holmes or Hans Namuth here. Rather than romantic heroes in the throes of creation, Rooney presents artists, critics and curators as every day, even suburban, folk. While there’s still a sense of documentation to the series—this is Rooney’s social and professional milieu, titled towards the Pinacotecha gallery scene—there’s a shift away from Rooney’s earlier conceptualised version of photography. The Ruscha-style randomness of Thirty-one bluestone pitchers 31 January 1972 (1972), the uninflected mapping of interior space in N.E.W.S. (1975) and the blunt street photography of the Fenced-off service station series (1977–78) is left behind. In the colour and intimacy of the portrait photographs, Rooney rediscovers affect. The photographs speak of Rooney’s engagement with his sitters, his entry into their worlds, even of his liking for them. Robert Rooney, ‘Maria Kozic and Phillip Brophy 1’, 1981, digital photographic print from original 35 mm slide, 20 x 30.5 cm. Copyright Robert Rooney. Courtesy the artist and Tolarno Galleries. This makes the attention that Rooney gives to the younger sitters in the series—Jenny Watson, John Nixon, Phillip Brophy, Maria Kozic, Paul Taylor, Howard Arkley—all the more noteworthy. While there are two portraits of many subjects, this younger cohort appear in more than one-fifth of the images in the series. In Kozic and Brophy (five photographs, together and alone), Rooney must have recognized kindred spirits. Like him, their beat was everyday life and the mass media, and their practice, too, was shaped by collecting and accumulation. But theirs was a playful and energetic approach. 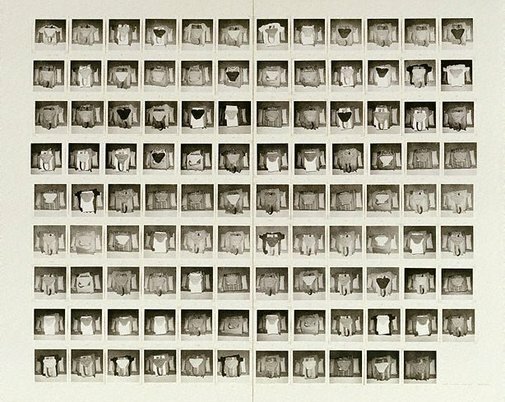 Where Rooney had forensically photographed his folded garments, Kozic simply snapped a Polaroid of every visitor to her home and pinned it to the kitchen wall. Kozic was re-enacting Warholian sociality in Northcote while Rooney developed SoHo conceptualism in Hawthorn. This new, unembarrassed affect was infectious. Rooney seems smitten with artists unselfconsciously declaring their enthusiasms and building them into an environment. 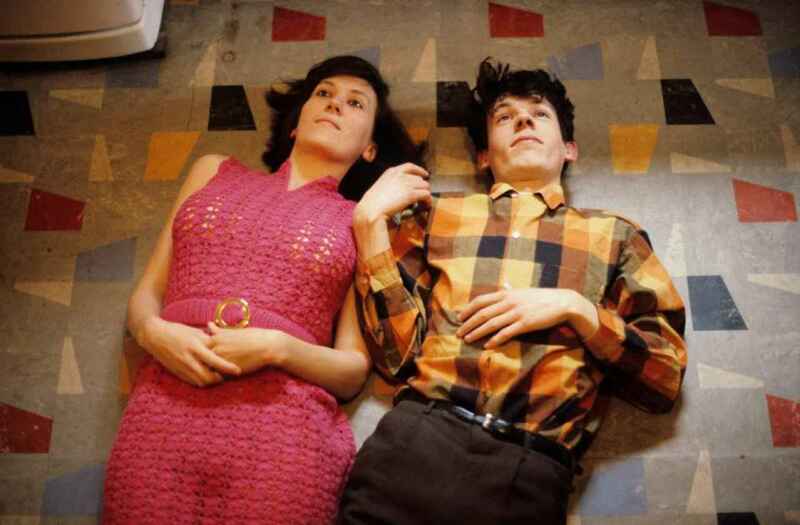 Rooney himself becomes playful; photographing Kozic and Brophy lying on retro linoleum of their kitchen and posing like pop stars in their inner-city backyard. Two and a half years into the series, Rooney sets aside studied, undemonstrative poses of his older peers in favour a stance more akin to David Bailey or Richard Lester. As Rooney’s attention shifted from his Pinacotecha peers towards this ‘New Wave’ generation, his portrait photograph series mapped a transition in the self-presentation of the artist. The older artists—Paul Partos, Alan Mitelman, Dale Hickey, Peter Booth—had adopted the style-less style of the early seventies; untended hair, unruly beards and thrown-together outfits. The younger players—Nixon, Watson, Taylor—clearly attend to coiffure, costume and pose. They address the camera consciously, with a sense of deliberation in their pose, leaving behind the distracted distance of their elders. This new style-consciousness seems to have fascinated and galvanized Rooney; there are more photographs of Watson than any other sitter. And he seems more inclined to pair artists and their work; Nixon, Arkley, Kozic and Brophy all pose in their studios or against a backdrop of art whereas there had earlier been little to suggest what Rooney’s sitters actually did. As was his habit, Rooney had set limiting conditions to the photographs; available light, no flash, no cropping. But is as if Rooney’s encounters with Watson, Arkley and others prompted him to set aside the ‘brute presence’ of photographic denotation in favour of the ‘encoded history’ of style, subculture and pose. 2 Which is to say, he embraced affect and admitted to the pleasures of the portrait.